Stan Beaton thought his late wife's answering machine recording was lost forever. Stan Beaton kept the recording his late wife, Ruby, made for their answering machine for over 10 years. He was devastated when his English telephone provider, Virgin Media, accidentally deleted it. But the company spent days doing everything they could to recover the recording [via BBC]. When he finds out that Virgin had 10 people working on recovering it, Beaton is adorably besides himself. "Really? Ten people?" he asks. "That must've cost a fortune. I'm staggered by that." He breaks down when he finally gets to hear the recording again. It's amazing to see a company really go out of their way to help someone out, even if, as Beaton puts it, it's "a bit of a PR job." Seeing Beaton moved to tears over something as simple as a voice recording might make you a bit teary-eyed. "It's just a wonderful, wonderful sound I thought was lost forever," he says. 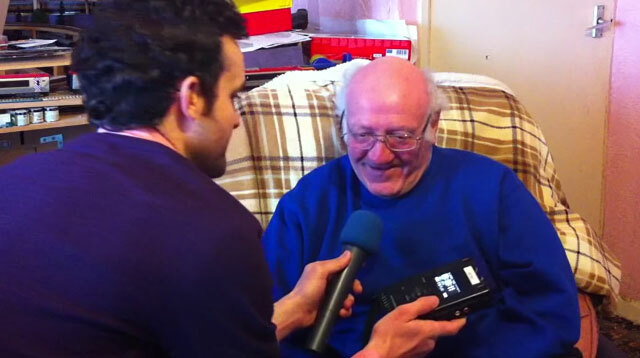 "Thank you, Virgin Media...You've made this old-age pensioner extremely happy."